The 2016 remake of the Roots mini-series premiered on History Channel tonight and you can meet the full cast right here. 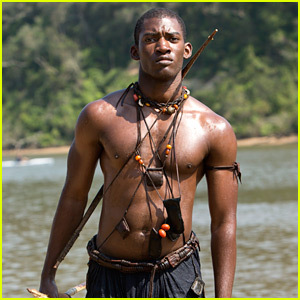 Malachi Kirby was introduced to the world in the first night of the mini-series as the important character Kunta Kinte. Other stars who will be featured in the four episodes include Forest Whitaker, Laurence Fishburne, Anna Paquin, Jonathan Rhys Meyers, Anika Noni Rose, and more! Roots is a historical portrait of American slavery recounting the journey of one family’s will to survive, endure and ultimately carry on their legacy despite enormous hardship and inhumanity. Spanning multiple generations, the lineage begins with young Kunta Kinte who is captured in his homeland in The Gambia and transported in brutal conditions to colonial America where he’s sold into slavery. Throughout the series, the family continues to face adversity while bearing witness and contributing to notable events in U.S. history – including the Revolutionary and Civil Wars, slave uprisings and eventual emancipation. 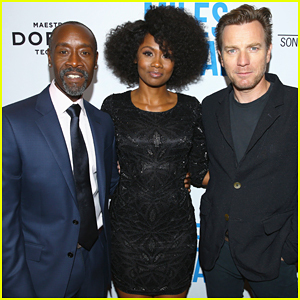 Ewan McGregor hits the red carpet with his co-stars Don Cheadle and Emayatzy Corinealdi while attending the premiere of their film Miles Ahead held at the Writers Guild Theater on Tuesday (March 29) in Beverly Hills, Calif. The three stars were joined at the event by Regina King, Lenny Kravitz, Michael Ealy, Aloe Blacc, Dr. Dre and his wife Nicole Young, Garcelle Beauvais, Alfre Woodard and Don‘s partner Bridgid Coulter, who all came out to show their support. While promoting Miles Ahead, Ewan revealed that production is officially underway for Trainspotting 2 to start filming in May. Rosario Dawson gives her pal Jurnee Smollett-Bell a big hug while attending the 2016 Oscars Sistahs Soiree on Wednesday night (February 24) at the London Hotel in Los Angeles. Also in attendance at the event, hosted by Alfre Woodard, were Aisha Tyler, Aja Naomi King, Anika Noni Rose, Emayatzy Corinealdi, Lorraine Toussaint, Loretta Devine, Yolonda Ross, and more. FYI: The event was presented by Tanqueray No. TEN. Lorraine is wearing St. John. 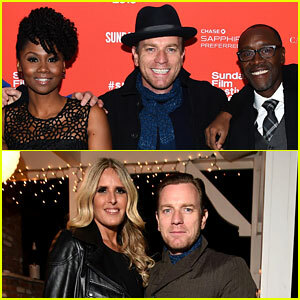 Ewan McGregor and Don Cheadle hit the red carpet at the premiere of their film Miles Ahead held during the 2016 Sundance Film Festival on Friday (January 22) at the Marc Theatre in Park City, Utah. The guys were joined by their co-stars Emayatzy Corinealdi and Keith Stanfield for the event. Just the day before, Ewan joined ​​festival director Tiziana Rocca at the TaorminaFilmFest in Los Angeles. Don recently discussed how Ewan was the reason the movie was able to get made. Dana Delany, Judith Light & More Hit the Summer TCA for Amazon Studios! Dana Delany flashes a smile while speaking to the press at her Hand Of God panel discussion during the Amazon Studios portion of the 2015 Summer TCA Tour on Monday (August 3) at the Beverly Hilton Hotel in Beverly Hills, Calif. The 59-year-old actress was joined at the event by her co-stars Ron Perlman, Julian Morris, Emayatzy Corinealdi, Alona Tal, Elizabeth McLaughlin, and creator/executive producer Ben Watkins. Also in attendance during the Amazon Studios portion was Transparent‘s Judith Light, Jeffrey Tambor, Jay Duplass, Amy Landecker, Alexandra Billings and Bradley Whitford, as well as The Man in the High Castle‘s Rupert Evans, Alexa Davalos, Rufus Sewell, and Luke Kleintank.